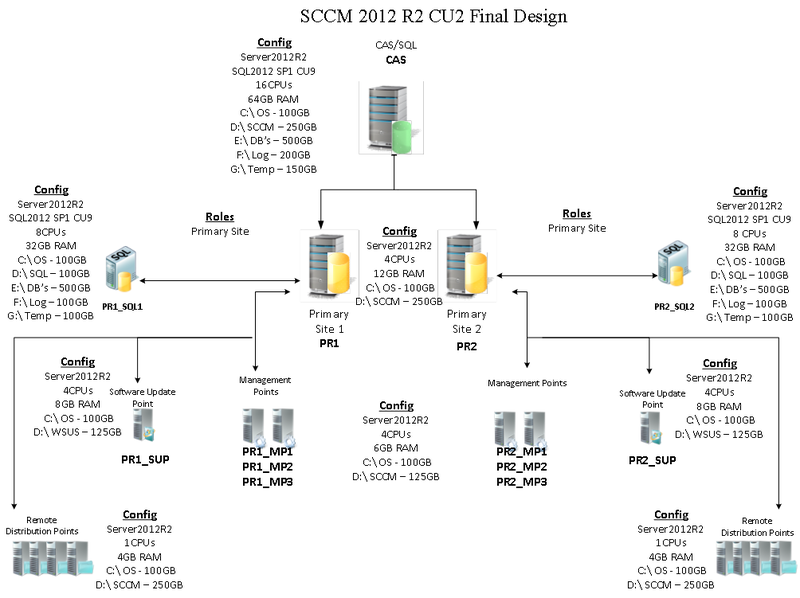 I’ts been a while since I thought about writing up a detailed article about one of my most recent SCCM 2012 R2 builds for an environment of roughly 120,000 clients and 230,000 users. The main reason I wanted to write about this was mainly due to the lack of information I was able to find during my initial research. When I was first trying to get a feel on how the system should be configured and just how little information I could find pertaining hardware specs. An important tip is to keep the server folks on your good side and work closely with them if you are not the server admin. The design above was executed through our VMware environment and thanks to our new Compellent SAN we provided the databases with the appropriate back-end IO. Our CAS server is managing about 105,000 clients and may soon have another 16,000 other clients where 10,000 may be Mac OSes. There are 2 Primary Sites configured where clients are divided almost evenly. Each site will have its own Fallback Status Point, once this piece is configured. Each site has three management points. Each site has one dedicated Software Update Point. There are a total of 185 Distribution Points configured. Rebuild Indexes on Sundays 5:00 – 11:00PM. Delete Aged Operations Monday through Sundays 12:00 AM – 5:00 AM. PR2 discovers remaining desktop related objects along with server objects every 7 days with Deltas configured. The environment is still new and will need a bit more work to be fully configured based on the decisions of the enterprise. Once a few more decisions are made by leadership we will start making additional tweaks to missing roles and getting the remaining clients on board. Update – I will be doing a new updated review to this article end of 2016 that talks about upgrade changes to this architecture now that SCCM 1606 is out. Also provide new links that Microsoft has added to further improve their documentation maximum sizing recommendations.